Think back to the last video. The big idea behind SketchUp is that you draw shapes and pull them into 3d, right? So this video will focus on drawing shapes. Everything you can create in SketchUp is either an edge or a surface, and usually an interesting combination of both. Edges can exist on their own. However, surfaces cannot. 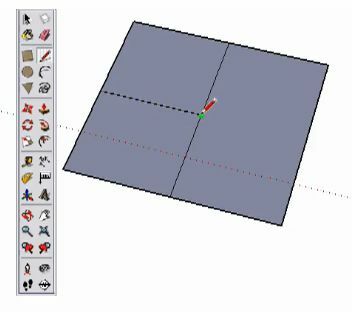 Every surface in SketchUp have a set of bounding edges. Erase one of those edges and the surface will be gone. This is true no matter how simple or complex your surface is. However, you can easily recreate a surface by drawing in the last edge. This is referred to as healing a surface. We can easily create or heal by drawing the final edges. We can do this in simple shape or draw the edges to heal even more complex shapes. 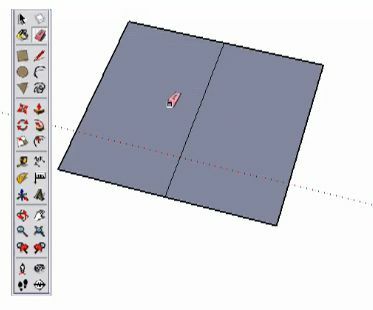 As simple as creating shapes is, there are still some guidelines you must follow to assure your success with SketchUp. So here they are, the 4 rules for drawing edges. The first rule you already know about. When drawing edges, you must draw a full closed loop of edges to create a surface. However, this closed loop of edges must also be coplanar. What does that mean? Well take a look at these 2 examples. Drawing the edge here complete this surface. However, drawing this edges does not complete this surface. We can see what the problem is by orbiting. Now we can see this line drops down. It isn't in the same plane as the other edges. This is rule 1 for drawing edges. Rule 2 for drawing edges relate to rule 1. 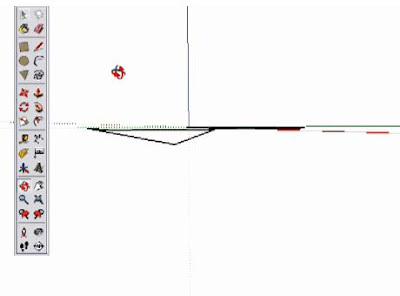 To help you draw edges that are coplanar, there are these red, green and blue axes built in SketchUp. You probably noticed already that when drawing edges, it will snap to become inline with an axis, and become red, green or blue in color to indicate that direction. The key to successfully using the axes directions is called inferring. Now yo can draw the edges with confidence that they line up perfectly. Inferring is the second rule of drawing edges. Make sure you practice and understand inferring and be patient as you do. Take your time and hove for a full 2 second over the point you are interested in. More importantly, make sure you see this edge color and dotted inference line when creating edges. It may seem a simple thing, but it can cause plenty of trouble later in your model when you aren't very careful about watching your inferences. Rule 3 for edges should be familiar. It deal with inference points that we already have been using. Everytime we draw a point from or to the end of an edge, we see a green dot indicating it is an end point. 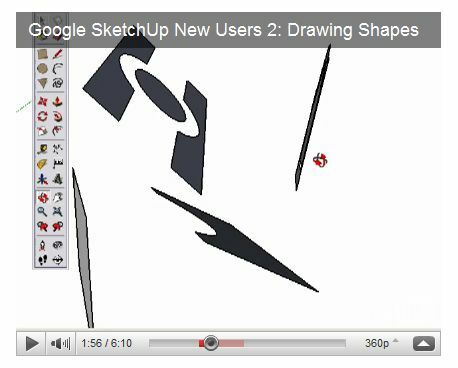 SketchUp snaps to these points to draw accurately and quickly. Review the different types of inference points. Endpoints are shown with green dots. The middle of an edge is shown with a cyan dot. Anywhere on an edge is shown with a red dot. Where 2 edges cross is shown by a black dot. Rule 3 for drawing edges is to use these inference points. Watch them closely to make sure that your are correctly as needed. Now that you know about rule 3 and inference points, Rule 4 will be easy. When drawing shapes in SketchUp, always draw to and from existing edges. Another way to put it is don't draw edges across another edge. A few examples should help to explain this. Say, you want to draw a rectangle divide into 4 parts, like this: Most of us will follow this step. Draw a rectangle, then draw a line form mid-point to mid-point in one direction. So far so good. Then draw another line from mid-point to mid-point in the other direction. But his doesn't work. It crosses over an edge and in fact if we examine the shape, it isn't properly divided. Think of the rule. We were OK up to this point, and instead of crossing the edge, draw from this mid-point to the mid-point of this edge. Then draw the final line from mid-point to mid. By following this rule, to only draw from and to edges, it creates the 4 equal shapes we need. This is true for any drawing tool that you are using. Don't cross any edge over another edge, whether it be a rectangle, circle or any other drawing tool. So that's it, the 4 rules for drawing edges. Draw coplanar edges in a closed loop to create a surface. Using referring and red, green and blue axes to help you draw accurately. Watch your inference points and draw from and to edges. 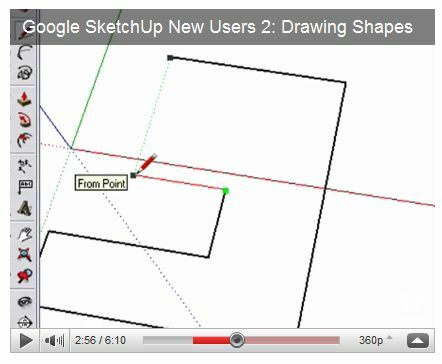 As you become more familiar with SketchUp, you will learn when you can bend these rules. But for starting out, follow them very closely. Now that you know some guidelines for creating shapes, move to the next video to learn about pulling those shapes into 3d (Push-Pull).